In the second half of the sixteenth century many calvinists and other protestants in the southern part of the Low Countries fled to the liberated areas in the North, where they hoped to exercise their religion without restraint. Among them many Francophones (‘Walloons’) who naturally wanted to follow the religious services in their own language. The first Walloon congregation was founded in Middelburgh (1574), Amsterdam followed in 1578 and Leiden in 1584. In Leiden already from 1578 on services were held in the French language. This confession of faith is one of the icons of the Walloon churches and for two centuries it was brought along to the semi-annual reunion of the synod together with the minutes and other records. From 1998 on the archives and the library of the Walloon churches in the Netherlands are deposited in the Leiden University library. The text is drawn up in 1561 by Guy de Brès , a protestant preacher in Tournai, and was intended to bring about a unity in the doctrine of faith among the protestants in the Walloon part of the southern provinces. One night a printed version was offered to the sovereign of the Low Countries, the Spanish king Philip II, by throwing a copy across the wall of the castle in Tournai. De Brès was imprisoned in the same castle in 1567, handed over to the Inquisition and brought to death on the 31th of May of that year. In 1580 the Walloon refugees in the North in the reunion of their synod in Antwerp accepted the 37 articles of his Confession as their official doctrine of faith. 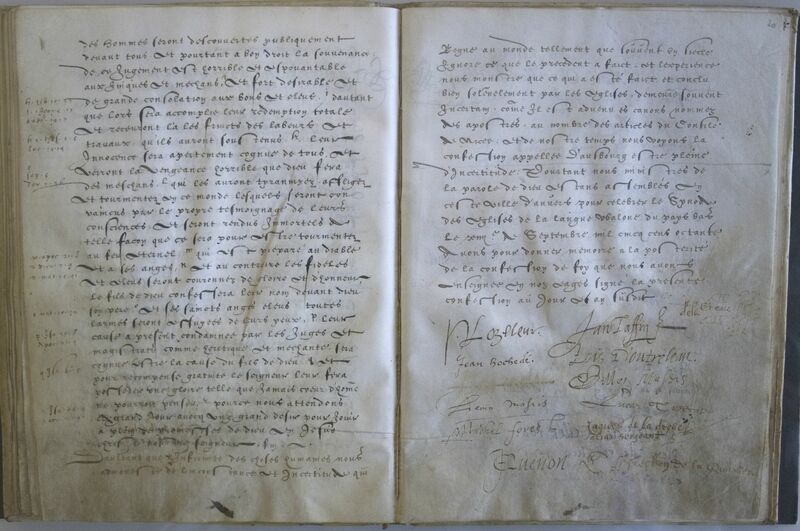 A copy was made of the printed text of the Confession and this was signed by all Walloon ministers and afterwards by all newly appointed ministers. This document contains the essentials of the reformed religious beliefs and was also translated into Dutch. At the National Synod in Dordrecht in 1619 by the name of ‘Confession of the Low Countries’ it became one of the three socalled ’formularies of unity’ which had to be signed henceforward by all reformed ministers and their newly appointed colleagues as a token of their rejection of the remonstrant doctrine. For that purpose a separate declaration has been inserted in the manuscript of the confession, which all Walloon ministers were obliged to sign after their appointment. After 1668 the signatures were written down in a new copy. With thanks to professor Henk Jan de Jonge, president of the Commission de l’histoire et de la Bibliothèque des Eglises wallonnes.